Japanese Mahjong (Japanese: 麻雀, 麻将 or マージャン; mājan), also known as Rīchi Mahjong, is a variation of mahjong. While the basic rules to the game are retained, the variation features a unique set of rules such as rīchi and the use of dora. The main mahjong article contains general terms, but only English and Japanese terms are used here. Terms like "chow," "pung," and "kong" are not used in this variation, yet their functions are still used. Instead, they are referred to in Japanese as chī, pon, and kan. In 1924, a soldier named Saburo Hirayama brought the game to Japan. In Tokyo, he started a mahjong club, parlor, and school. In the years after, the game dramatically increased in popularity. In this process, the game itself was simplified from the Chinese version. Then later, additional rules were adopted to increase the complexity. Mahjong, as of 2010, is the most popular table game in Japan. As of 2008, there were approximately 7.6 million mahjong players and about 8,900 mahjong parlors in the country. The parlors did 300 billion yen in sales in 2008. There are several manga and anime devoted to dramatic and comic situations involving mahjong (see Media). Japanese video arcades have introduced mahjong arcade machines that can be connected to others over the Internet. There are also video game versions of strip mahjong. Japanese mahjong is usually played with 136 tiles. The tiles are mixed and then arranged into four walls that are each two stacks high and 17 tiles wide. 26 of the stacks are used to build the players' starting hands, 7 stacks are used to form a dead wall, and the remaining 35 stacks form the playing wall. There are 34 different kinds of tiles, with four of each kind. 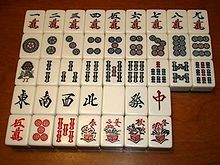 Just like standard mahjong, there are three suits of tiles, pin (circles), sou (bamboo) and wan (characters), and unranked tsū (honour) tiles. Honour tiles are further divided between Wind tiles and Dragon tiles. Some rules may have red number five tiles which work as dora that earn more han value. The flower and season tiles are omitted. Names for suit tiles follow the pattern of [number] + [suit], the numbers being Japanese pronunciations of the corresponding Chinese words. Pin (筒子, pinzu): Named as each tile consists of a number of circles. Sou (索子, sōzu): Named as each tile consists of a number of bamboo sticks that hold a hundred coins each. The face of the number one tiles is a bird. Wan (萬子, wanzu, or manzu): Named as each tile consists of a number of ten thousands (萬, wan, or man; see the lower character on the tile). Originally, this was 10,000 coins made up of 100 strings of 100 coins each (see mahjong tiles). The kanji of number five usually becomes "伍" instead of "五." Wind tiles (風牌, kazehai): Named after the four cardinal directions. Dragon tiles (三元牌, sangenpai): White (白, haku), Green (發, hatsu), and Red (中, chun). Often, the face of the White dragon tiles is blank white. The kanji of the Green dragon tiles in Japan is usually 𤼵 which is slightly different from 發 since it includes the kanji 矢 instead of 殳. Many basic rules of mahjong apply to the Japanese variation. Players can make a meld by calling for another player's discard. They reveal the meld on the table and then make their own discard. Calling for another player's discard makes the meld and the hand open. When a winning tile of a closed hand is a discard, the meld including that discard is also considered open, while the hand is still regarded as closed. The calls operate exactly the same as any variation of mahjong, except Japanese terminology is used. Players can make an open sequential meld by calling out "chī" (吃 or チー) using a tile discarded by the left player, who is prior in order. Players place the meld face up on the table, usually on the right side of their hands, with the discard placed sideways at the leftmost position of the meld to indicate which tile was taken from the left's discard pile. Players can make an open meld of the same three tiles by calling out "pon" (碰 or ポン) using a tile discarded by any other player. Players place the meld face up on the table with one of those tiles placed sideways to indicate from whom the discard was taken. There are three types of quads and players call out "kan" (槓 or カン) for all of those types. After calling a quad, the next adjacent dora indicator tile is flipped, and players need to draw a supplemental tile from the end of the dead wall. Depending on the rules, the number of tiles in the dead wall is kept at 14 by reserving the last available tile from the wall, or the number decreases at that time. Closed quad: Players can make a closed quad by calling out "kan" using the same four tiles in their hand. They reveal the meld on the table usually with the two inside tiles faced up and the two outside tiles faced down. A closed quad doesn't use another player's discard, but a player must declare and reveal a quad if they wish to draw a supplemental tile from the dead wall. Declaring a closed quad doesn't open a hand. Open quad: Players can make an open quad by calling out "kan" using another player's discard and the same three tiles in their hand. They reveal the meld on the table with all four tiles faced up, with one of those tiles placed sideways to indicate from whom the discard was taken. Players cannot make this type of meld using an open meld of three tiles. Added open quad: Players can make an added open quad (kakan; 加槓) by calling out "kan." They can add a self-drawn tile or a tile already in their hand to an open meld of the same three tiles. The tile is usually added sideways on top of the sideways tile in the open meld. The precedence order to pick up a discard when two or more players need the same discard is firstly ron (winning), secondly kan or pon, and lastly chī. Kan and pon cannot happen at the same time since there are only four of each kind of tile. While the basic rules to mahjong apply with the Japanese variation, an additional, distinct set of rules are applied. Yaku are specific combinations of tiles or conditions that yield the value of hands. Unlike many variants, a winning hand consists of four melds requires at least one yaku. When scoring, each yaku has its own han value, and the han works as a doubler. A winning hand needs at least one yaku. Yakuman is a value for limit hands which are hard to get, and in some variations multiple yakuman are applied. Declaring rīchi means declaring a ready hand, and is a kind of yaku. A player may declare ready if a player's hand needs only one tile to complete a legal hand (tenpai), and the player has not claimed another players' discards to make open melds. When declaring ready, a player can win on a discard even when the hand didn't have a yaku because ready itself is a yaku. Upon declaring ready, the player must pay a deposit and may no longer change their hand except when forming certain closed quads. As a possible rule, a player can choose to reveal their hand to win more points if successful, which is called ōpun rīchi (open rīchi). In that case, the player shows only the tiles that are related to waits, or reveals all the tiles in the hand depending on the rules. The declaration increases the yaku count allowing the player to score extra points. Dora (ドラ) is a bonus tile that adds han value to a hand. Every kind of tile can become a dora tile. A dora tile adds the same number of han value as the number of its corresponding "dora indicator" tiles. Dora is not counted as yaku, and having it without yaku does not meet the one yaku requirement for a winning hand. At the start of a hand, the third tile from the back end of the dead wall on the upper stack is flipped and becomes a dora indicator. Then, its succeeding tile is recognized as dora. For example, if an indicator is a Green dragon ( ), Red dragons ( ) are counted as dora by the sequence shown below, in which the Red dragon wraps around to the White dragon ( ). The number of dora indicators increases in the following manner: Each time a player calls a quad, the next adjacent dora indicator tile is flipped, starting with the fourth tile from the back end. The indicator is flipped immediately after the quad is called, and after that the player draws a supplemental tile for their hand from the back end of the dead wall. The number of indicators increases in that direction, which becomes five if a single player calls four quads, and that is the largest possible number on the upper stack (see four quads). In addition, when a player goes out with a declaration of rīchi (ready hand), the tiles underneath the dora indicators are flipped after the win and become additional dora indicators, making their succeeding tiles also counted as dora which are called ura-dora (裏ドラ, underneath dora). It is said that the name dora stands for "dragon," although it has nothing to do with dragon tiles in contemporary Japanese mahjong. Red 5 tiles: A variation uses specially marked red number 5 tiles that also count as dora themselves, regardless of dora indicators. In addition, if a dora indicator is number 4 of the same suit as red 5 tiles, players acquire further han value. One red 5 tile for each suit is usually used, with some versions using two tiles for each suit. In some variations, tiles of other numbers such as 3 or 7 can be marked red. In the Japanese scoring system, two factors are considered: the han value and fu value. If the han value is five or more, then the fu value is still counted but no longer necessary. A winner acquires points based on these values, which correspond to a points-value table. There is a distinction between winning from the wall and winning from a discard. When going out, players call out "tsumo" (自摸 or ツモ, self-drawn) or "ron" (栄 or ロン, picking up a discard), and not "mahjong". In the case of tsumo, the other three players share the responsibility of paying out points, according to the scoring table. For ron, the player who discarded the tile pays all of the points. In many mahjong variants, discards are simply placed in the middle of the table in a disorganized fashion. However, with the Japanese variant, tiles are neatly placed in order of discard in front of each player. In turn, each player accumulates a discard pile, with each hand. Typically, discards are placed in rows of 6 tiles per customary rule. In addition, open calls for chii, pon, and kan have discard specific rules, by which they must indicate the source and type of discarded tile. This way, a record is maintained for all discarded tiles corresponding to each player. Likewise, game strategy depends on the state of the discards and the players' hands. A player cannot win on any discard if the same tile is currently in the player's own discard pile. The rule also applies for multiple waits, that is, if any kind of tile in the discard pile can make a required combination irrespective of having yaku or not, a player cannot win off of any discards. If another player’s discard can make a required combination irrespective of having yaku or not, a player cannot win on any discard after it until the next turn or until making an open meld. After declaring ready, a player can no longer win on any discard if the player has discarded a winning tile from the wall or has passed on a winning discard. For all of these rules, if discards are not in the discard piles because they have been called to make open melds, the rules still work for such discards. Kyūshu yaochūhai tōhai (九種么九牌倒牌), or Kyūshu kyūhai (九種九牌): On a player's first turn when no meld has been called, if a player has nine different terminal (also known as major) or honor tiles, the player may declare the hand to be drawn. For example, the hand may be . They could instead go for the nonstandard thirteen orphans (kokushi musō) hand. Sūfontsu rentā (四風子連打): On the first turn without any meld calls, if all four players discard the same Wind tile, the hand is drawn. Sūkan sanra (四槓算了): The hand is drawn when a fourth quad is called, unless all the four quads were called by a single player. If all four quads were called by a single player, the hand continues. In this case, depending on the rules, calling a fifth quad makes the hand drawn, or calling a fifth quad is not allowed at all. A game ends after the last hand of the last round, which is usually the South (prevailing wind) round. A game ends when a player's score becomes zero or less, or when it falls below zero depending on the rules. Some rules may allow continued gameplay with a player having a negative point value. In the rule of win and finish (agari-yame, あがりやめ), if the dealer in the last hand of the last round wins, they can select to end the game immediately or to play an additional hand, for instance when they are the top player at the time. If the points of the top player are below 30,000 after the last hand of the last round, the game continues into the West round (西場) in some rules. This situation is called shānyū (西入; entering West). The prevailing wind becomes west. A North round (北場) may come next in the same way. Depending on the rules, it can be followed by an East round again or instead White dragon, Green dragon, Red dragon and East rounds. Any extra round ends as soon as one player has 30,000 points or more. At the end of a match, players are often given bonus points or penalties depending on their place (see final points and place). In an optional rule called yakitori (焼き鳥), if one did not win a hand in a match, that player pays a penalty. At the start of a match, each player has a marker called yakitori māku (mark) (焼き鳥マーク) on the table, and a player flips their own after winning a hand. Chips or coins are also used as substitutes, and they are often removed instead of being flipped. There is a three player version called sanma (三麻). Two player mahjong is also found in video games. This variant is featured in anime and manga series such as Akagi, Saki and Mudazumo Naki Kaikaku. A live action series named Shin Janki (真・雀鬼) features the game involving yakuza and gambling, while employing various cheating tactics and techniques. The variant is available via online play, notably Tenhou.net and Ron2.jp . In addition, many game consoles port mahjong games, as well as various PC software.